Utrecht, The Netherlands – The Dutch Watch Professionals (DWP), founded at the beginning of 2017, intends to become a branche organization for Dutch watch brands and the deliverers of this industrial branche. On May 27 2017 they organize the first Dutch Watch Showcase (DWS), a bourse for the above mentioned companies, taking place in Utrecht, The Netherlands. In 2016 a couple of Dutch watch brands came up with the idea to organize the substantial number of ‘microbrands’ that make watches in the Netherlands. Targets of this initiative are for example sharing of knowledge and experience, combined purchases, combining marketing and advertising and an unambiguous face to the outside world. Another striving is to formulate a ‘Dutch Made’ hallmark to which standards these watches have to comply to. 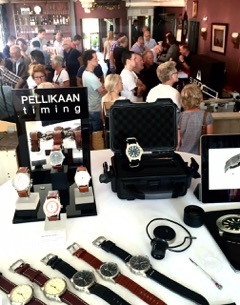 On May 27 2017 the DWP organizes the first Dutch Watch Showcase in Utrecht in The Netherlands. This bourse is meant for the Dutch ‘microbrands’ of watches and the deliverers of this industrial branche (engravers, manufactures of watch straps, watchmakers etc.). The location is in the historic centre of Utrecht at the Oudegracht. Presentations and interviews are also part of the program so this will be an entertaining afternoon for the real watch fan. At this moment the following brands are confirmed for the DWS. Date : 5/06/2017 01:02:00 π.μ.